I needed a break. I’ve been working solidly since 5:30am. There was a spot that I passed on my drive back to the cabin that I wanted to go and photograph. It would be the perfect place to do second vlog too. I jumped in my car and realized that even though it was 2:30pm I still needed to use my Auto Start to warm the car up. Whoops. When I looked up though I saw all these little ice crystals that looked like snowflakes. I didn’t even see that tree until I looked at the photo. Pretty cool, right? I don’t know if I can do a video everyday, but I am trying for more often than not. Here is my 2nd video blog… you will notice that I forgot to bring my gloves. Again, won’t make that mistake again!! It was 22 degrees out and just too cold to be outside for more than a few minutes without the proper gear. 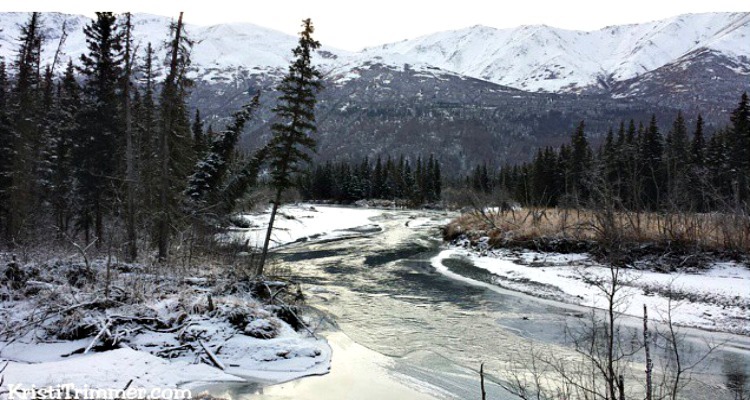 If you were in Alaska, what would you like to see – tell me in the comments. Oh, and if you could subscribe to my YouTube Channel, that would be awesome. Loving the video blogs! My husband and I met you on the day you arrived in Seward just after we’d finished our glacier hike in June and it’s amazing to see how the landscape is changing! I do remember you guys!! Funny, I just got back from a road trip through the South. I think we were in some of the same states last week. You wouldn’t believe how it looks up here now. Seward is still my fave place and I can’t wait to get back down there again. Hope you come back up here – it has definitely won me over!